Over 500 million users! That is the universe for your app. So “learning Facebook” is critical. 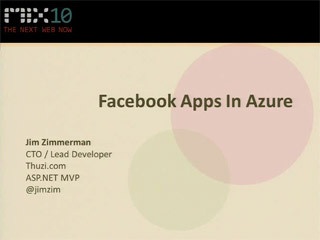 Come learn how to use the Facebook C# SDK built in cooperation with Microsoft and Thuzi, a Facebook Preferred Partner. Thuzi will also share lessons from creating Facebook promotions that have been architected to handle over 10,000 signups an hour. We will show how to build Facebook applications with .NET using ASP.NET MVC, Web Matrix, Web Forms, Silverlight and WP7 and how to host them on Windows Azure. Font in VisualStudio and other apps is way to small in this video. Can computer display be enlarged to full screen, please?